Lyndsay Ward | What is ML Reading? Here’s another great one published this year. 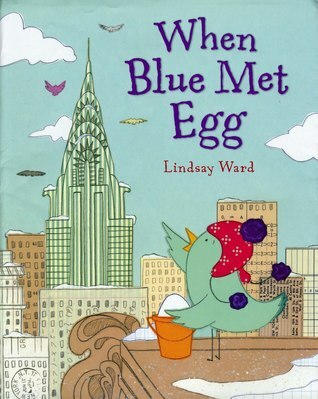 When Blue Met Egg by Lindsay Ward is set in New York. A mysterious egg flies through the air and lands in Blue’s nest. It’s early for an egg. Central Park is filled with snow. Blue searches for Egg’s mother at the Boathouse and Bethesda Fountain in Central Park. Then, she ventures into the city with Egg in a basket. They view the Empire State Building, move on to Battery Park and then take the subway back to Central Park. Blue has not succeeded in finding Egg’s mother. So they make the best of it .. riding the carousel … crossing the Brooklyn Bridge … visiting the Guggenheim Museum … attending an opera at the Metropolitan Opera House. In April the city begins to thaw. Egg is getting smaller. Blue is concerned Egg is sick. So she serves Egg soup but it makes Egg smaller and weaker. Any guesses on what happened to Egg?